I am sorry to learn of two deaths in quick succession in the new year both of people who had given much to their local communities. Marie Corney died on 22 December in Fuerteventura, Canary Islands, aged 78. Loving wife of Alan, and devoted mother to Rachel and Stephen and beloved Nana of Hayden and Sarah. She and Alan enjoyed rewarding careers which took them round the world. 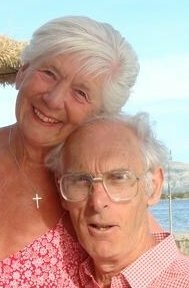 They moved to Adderbury after retirement, first living in Horn Hill Road and them moving to Lake Walk but they also enjoyed their holidays in Mallorca, the Canary Islands, Spain and Portugal. Marie was a Friend of Adderbury Library and worked as a volunteer. More recently she became an editor of the local village magazine Adderbury Contact utilising her computer skills. She is pictured here with her husband Alan who survives her. Jim Flux died on 8 January 2017 after being taken ill while engaged in one of his favourite pursuits – bell ringing. Jim had enjoyed a successful business career before retiring to live with his wife Jean in Deddington. He engaged in voluntary work and was the leading light in establishing the Carers Centre in Banbury, prompted by a visit from the national Carers charity patron, the Princess Royal. Jim was also a Deddington Parish Councillor and served as Chairman of the parish council for some time. Jean died some years ago but Jim worked on in his many voluntary roles in great style. North Oxfordshire will be the poorer for the loss of both of them. This entry was posted in Local and tagged Jim Flux, Marie Corney. Bookmark the permalink.